So we purchased a sky blue Penstemon cultivar with a tag labeled "Penstemon Margarita BOP." Bureau of Prisons? Bottom of the Pyramid? Business Owner's Policy? Basic Operation Plan? Breach of Peace? No, none of the above. It's an acronym for "Bottom of the Porch." Las Pilitas Nursery, Santa Margarita, Calif., named it that because...well...it was growing at the Bottom of the Porch. The label explains that the "seedling that came up sometime in the early 1980s. Every year it would flower and be gorgeous clear sky blue, fading to purple. We've never watered it nor maintained it. Every year we talked about how beautiful, neat, clean it was. The bicycles, skateboards and dogs have run over it tens of times but it still looks good at the bottom off the porch." 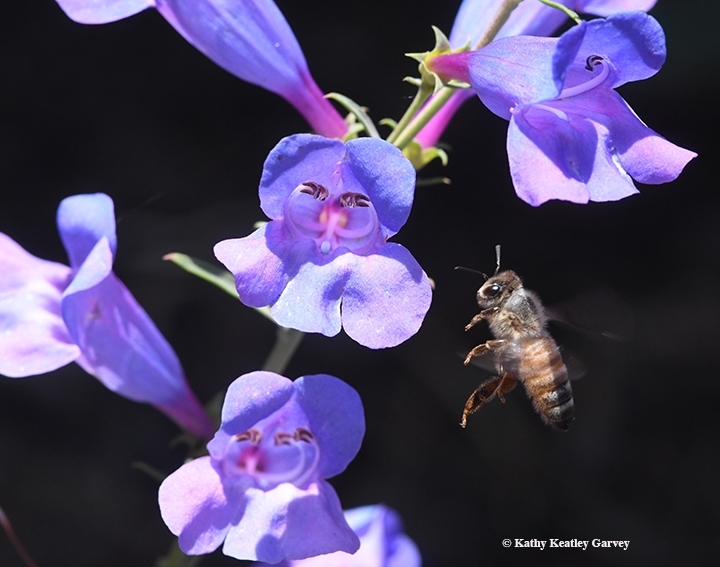 Horticulturists tell us that Penstemon is the largest genus of flowering plants endemic to North America. It's known for its tube-shaped, two-lipped flowers. The name, Penstemon? It's derived from the Greek word, "penta," meaning five, referring to the infertile fifth stamen. 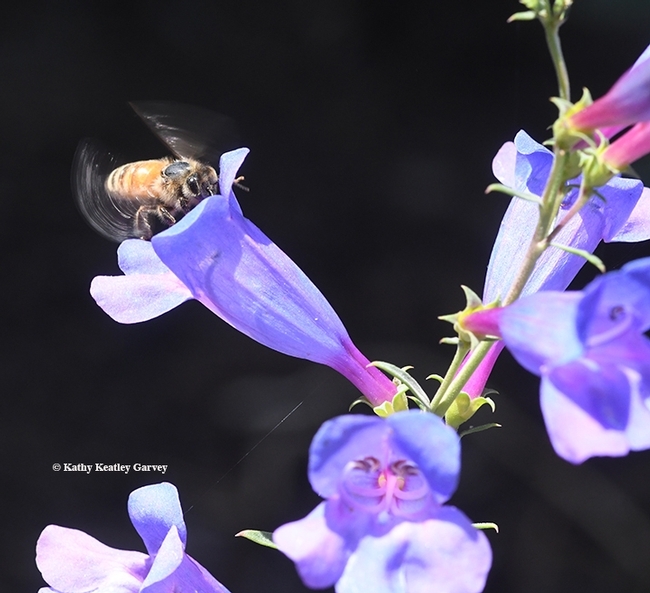 But if you look closely, you can see why its common name is "beardtongue." See the open mouth and protruding fuzzy tongue? Whatever its origin or structure, it's a magnet for honey bees, bumble bees and butterflies. We observed honey bees engaging in scores of balletlike maneuvers: somersaults, cartwheels and pirouettes. Or maybe we should just call the moves "bee-bopping." 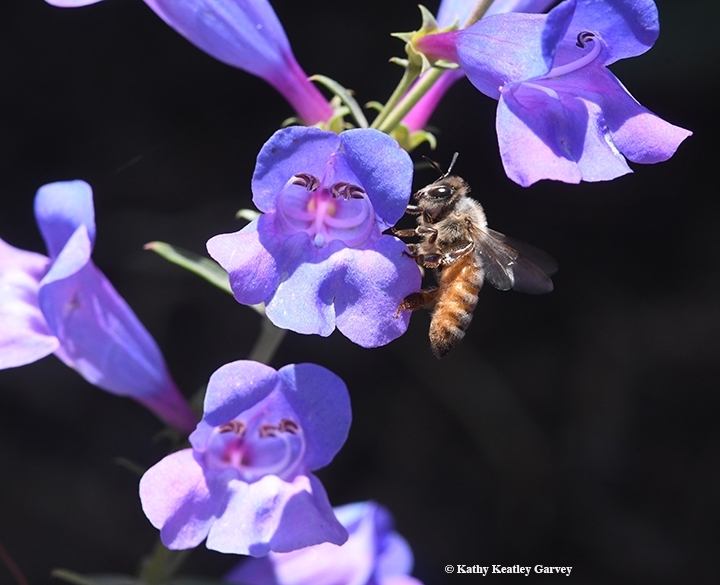 I had the good fortune to observe a penstemon specialist, Pseudomasaris vespoides, pollinating and patrolling around my patch of Margarita BOP. Those crazy golf club antennae on the males are over the top! Love to send you a photo. Thanks for all your splendid shots and comments! Kathy, your photos are outstanding. 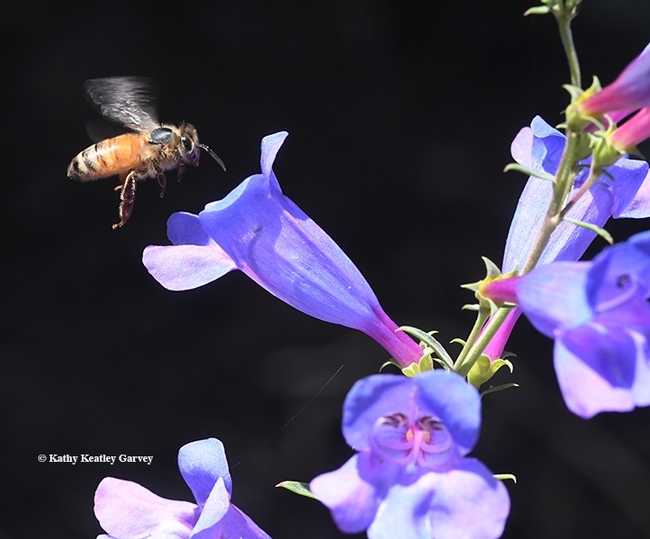 Could you share information about the camera equipment you use for your floral and insect close-ups?